Top images (A): Illustrates the development of stem cells on hydrogel, a soft substrate, to pre-bone cells after the removal of water. 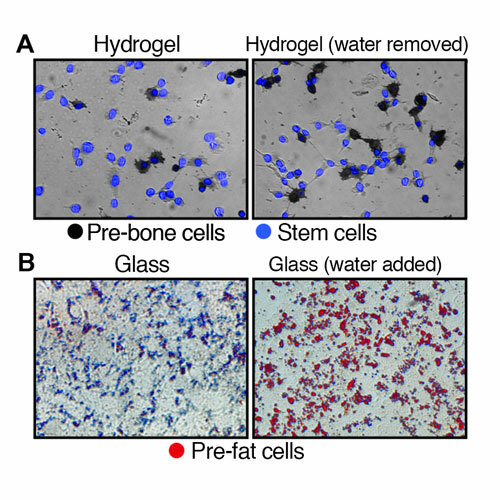 Bottom images (B): Depicts the development of stem cells on glass, a hard substrate, to pre-fat cells after the addition of water. Adding or removing water from a stem cell can change the destiny of the cell, researchers have discovered in a new study published in the Proceedings of the National Academy of Sciences (PNAS). The study was led by Ming Guo, d’Arbeloff Assistant Professor in the Department of Mechanical Engineering at MIT; and David Weitz, Mallinckrodt Professor of Physics and of Applied Physics in the Harvard John A. Paulson School of Engineering and Applied Sciences. “The findings from this study add a fascinating new tool to our understanding and utilization of stem cell biology for regenerative medicine,” says Praveen Arany, co-author and assistant professor in the Department of Oral Biology in the University at Buffalo School of Dental Medicine. A similar experiment was conducted using glass. Researchers placed stem cells on glass to simulate a stiffer environment and found that few of the cells developed into pre-fat cells. It was not until the volume of the stem cells were increased by 20 percent that a spike in the formation of fat cells was found. The investigators discovered that changing the volume of the cells caused them to behave similarly to if they were under environmental pressures. “The surprising thing about these experiments is the observation that volume seems to be related to so much about the cell. It seems to dictate the cell stiffness as well as the cell fate,” says Weitz, who is also a core faculty member of the Wyss Institute for Biologically Inspired Engineering and director of the Materials Research Science and Engineering Center at Harvard. "Stem cells sit at the forefront of regenerative medicine, providing researchers and clinicians with the potential to repair or replace damaged tissue and organs." Aside from physical cues such as cell stiffness or volume, stem cell differentiation can be influenced by a number of biological factors, biophysical agents or pharmaceutical drugs, such as light, ultrasound and radio frequencies. Other investigators on the study include Enhua Zhou, investigator at the Novartis Institutes of BioMedical Research; Dylan Burnette, assistant professor at Vanderbilt University; Mikkel Jensen, assistant professor at California State University, Sacramento; Adrian Pegoraro, research associate at the University of Ottawa; Karen Kasza, Clare Boothe Luce Assistant Professor at Columbia University; Angelo Mao, postdoctoral fellow at Harvard University; Yulong Han, research fellow at Harvard University; Jeffrey Moore, associate professor at University of Massachusetts at Lowell; Frederick Mackintosh, professor at Rice University; Jeffrey Fredberg, professor at Harvard University; David Mooney, Robert P. Pinkas Family Professor of Bioengineering at Harvard University; and Jennifer Lippincott-Schwartz, group leader at the Howard Hughes Medical Institute.